Xcom 2 is a turn based strategy game about human resistance fighters trying to overthrow the aliens who now control Earth. If you played the first of the new Xcom games Enemy Unknown or its expansion Enemy Within and did not like them then you will not like this one any more. Lots of little things have changed but the visuals and mechanics are still very much in the same vain as the previous game. It is improved in most ways but nothing is different enough to sway opinions on the series. If you did enjoy the previous Xcom then chances are that you will enjoy this one too. This review is more for the people who have never played an Xcom game or were left on the fence about their feelings towards them. Graphically, Xcom 2 has had some noticeable upgrades. The style is the same but texture quality and detail has been improved, making the game a lot more aesthetically pleasing and more constant in its presentation. It still won’t win any awards for its visuals but then it isn’t trying to sell itself on its looks like other games might. 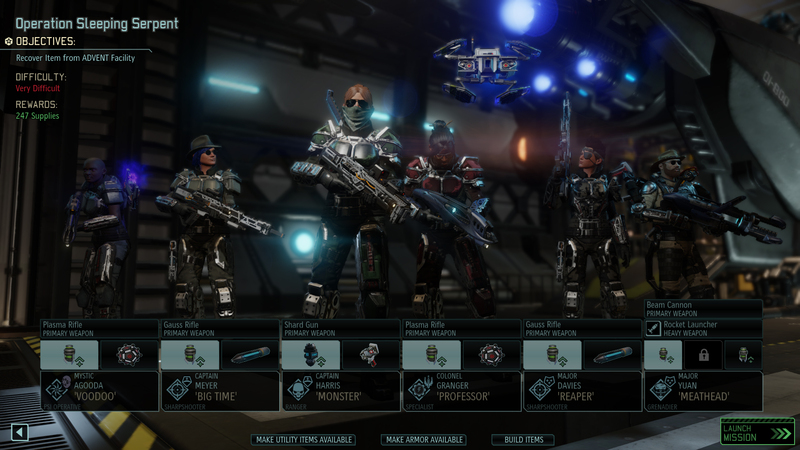 One of the more fun aspects of Xcom is the ability to customise your soldiers. These options have been massively increased in number two, giving the player a whole host of colours, props and armour to pick from. Character information can also be changed now like country of origin and gender. Granted, many of the options are unavailable until the soldier reaches certain ranks but even the options for fresh recruits are more diverse than anything in the previous games. You could spend hours just creating soldiers if you are a creative kind of person. This also adds to your investment in the characters in battle. 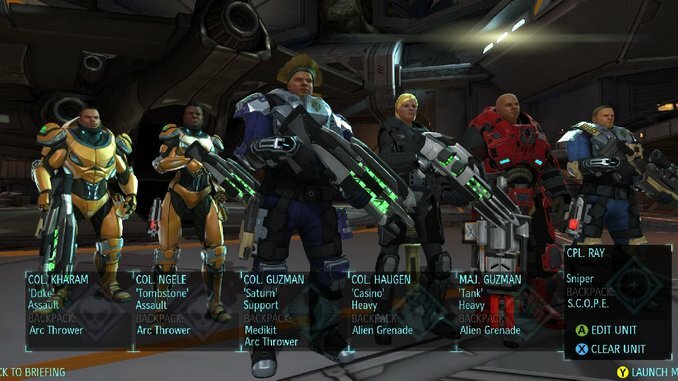 An Xcom Enemy Unknown squad. The bulk of the gameplay though will take part on the battlefield so what is new there? It plays much the same as Enemy Unknown in that you move your soldiers and fire based on hit percentages then the enemy replies in kind. There are a few new mechanics to change things up though like being incognito at the start of a mission until you actually step into an enemy’s range of view or attack. This means that enemies don’t instantly know where your characters are and you can set up planned ambushes to make your first turn of attack really count. There are also plenty of new enemy types to face off against and the soldier classes have been changed. The Specialist class can focus their skills as a medic, healing other characters anywhere in a battle with their gremlin rather than having to stand at their side, the Ranger class has a sword that you can use to charge at enemies in range which don’t rely on ammo or line of sight but do leave you out in the open and the Snipers can specialise in pistols making them a viable close combat unit. This added diversity makes your squad feel very versatile and can really alter the way you play depending who is in your team on any given mission. A new enemy type in the form of the Vipers. I haven’t encountered any major bugs with the game but it still does not run perfectly. Loading times are very long, be it waiting for a mission to start or enemies taking ages to react when you first trigger them. Unit selection and placement can also be tricky, especially if they are surrounded by cover or in a multi-level environment. These can be annoying but don’t make the game unplayable. Its sad but having a game that works is actually a selling point in modern gaming. Xcom 2 is a difficult game, probably harder than number one at the beginning. Regular saves and reloads is a method to make the game easier but this has been limited from previous games in that if you save then shoot you will always get the same result if you reload without making any different moves. If you don’t like challenging games then this game is probably not for you. It takes patience and the willingness to learn how the game really works. Once you get the swing of things though it feels rewarding to clear out a battle without getting injured. Watch you soldiers grow as combatants as you grow as a commander. With all of that said, I think that Xcom 2 is a fun game that has improved and altered itself enough from number one to be a great sequel. It has no real drawbacks if you enjoy this style of game so for these reasons I will give it an 8 out of 10. ← The Failures of Fable and how it could have Survived.